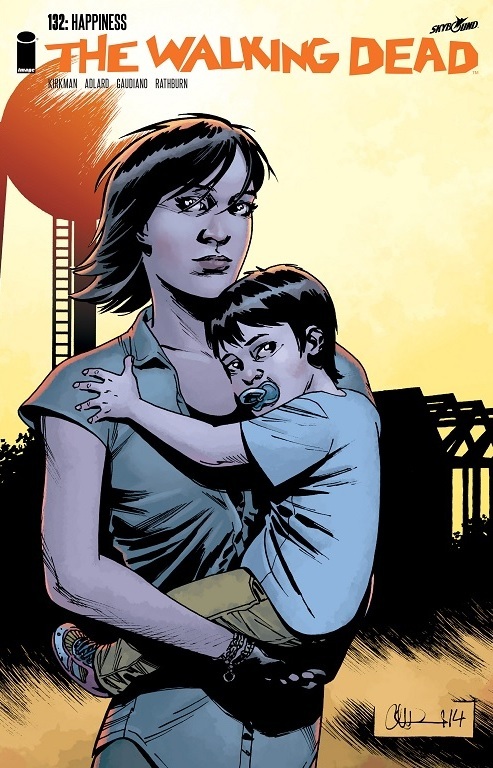 A Look at The Walking Dead #132: “Happiness” | What Else is on Now? 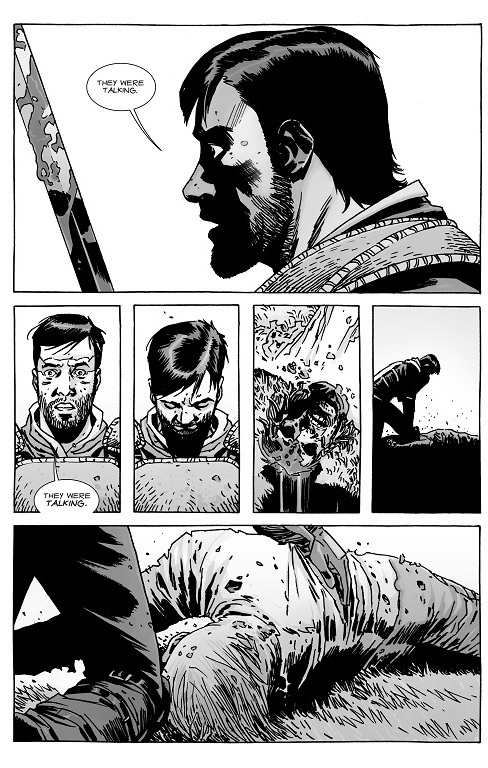 Much like other recent issues, The Walking Dead #132: “Happiness” begins with a reveal or moment brought up at the end of the previous issue and is handled fairly quickly. Well, not really handled as much as it was just brushed aside for now. 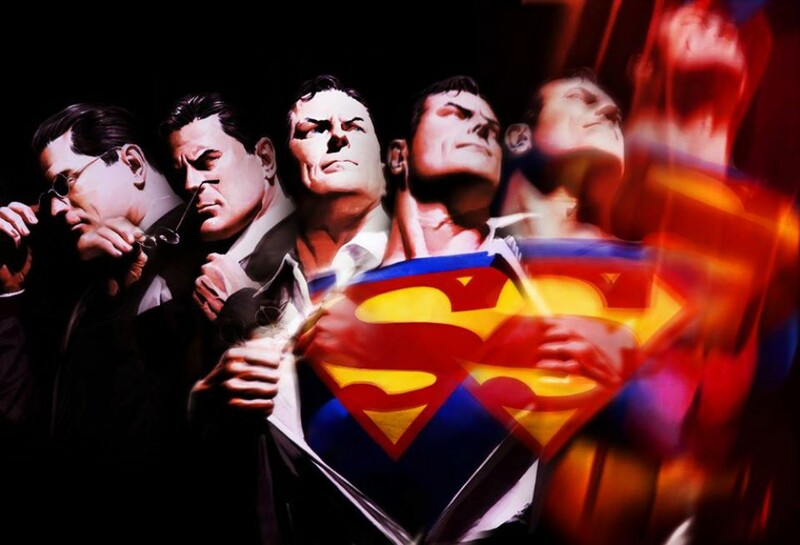 The issue focuses on three different stories, though the one in Alexandria only took up one page. 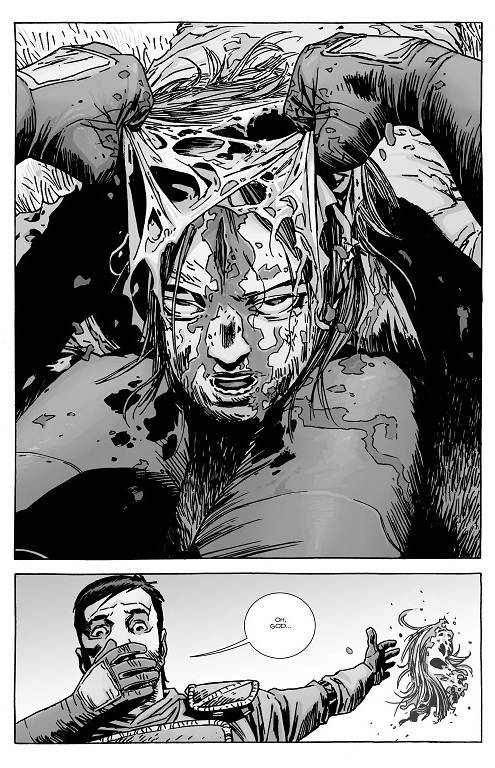 So Magna and the other survivors have Andrea, but obviously it doesn’t look like they’re going to be harsh on her. 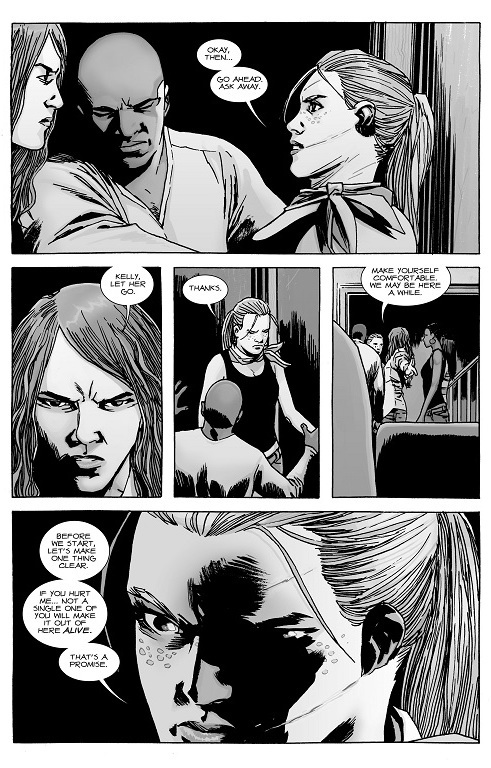 And even if they were, I figured Andrea wouldn’t let herself get into trouble if she didn’t have an exit strategy. And I fully believe that she’d find a way to retaliate if Magna brought her any harm. Heck, there’s a reason Andrea is one of the best shots around. 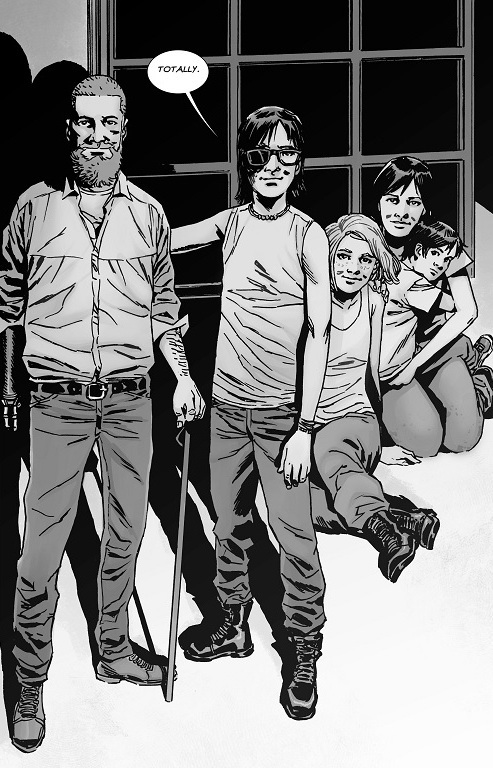 The moments with Rick, Carl, Maggie and Sophia really spoke to the humanity that everyone wants to reclaim in the face of so much chaos in their lives. Much like just having a normal conversation or playing chess, the idea of watching the sunset may seem boring to Carl, and it probably was, but really, that’s about as normal as everyone has had it for some time. It’s brief, but the four enjoy some peace and quiet that they’ve deserved for some time. Maggie told Rick last time that if he could do it all over again, he wouldn’t watch any television. Chances are both of them would spend as much time with their families as possible. They’ve both lost people close to them and this is the closest thing to a family they may get, so they savor the little moments. Sure, these moments don’t add much to the overall plot of the issue, but they give the characters a glimpse at how precious life is and how they should cherish every moment. Then we have the big reveal. This I did like not just because I didn’t see it coming, but also because we haven’t seen this explored before. You had Negan willing to use walkers to combat anyone who stood against him, but here we have people dressing up as roamers and wearing their skin. This raises all sorts of questions and this definitely had me wanting more. Who was behind this? Where did they come from? How did they go about this plan? I can’t imagine this was easy, given how the people wearing roamer skin were able to keep it on and fight without breaking character. It also made me wonder is anyone else out there doing this? This could actually put a new spin on things because it means some of those wandering roamers are actually humans underneath. But what’s the purpose of it all? I don’t think Dante will be killed- or, at least, not immediately- since he’ll probably have as many questions as readers do and someone will have to alert the others. 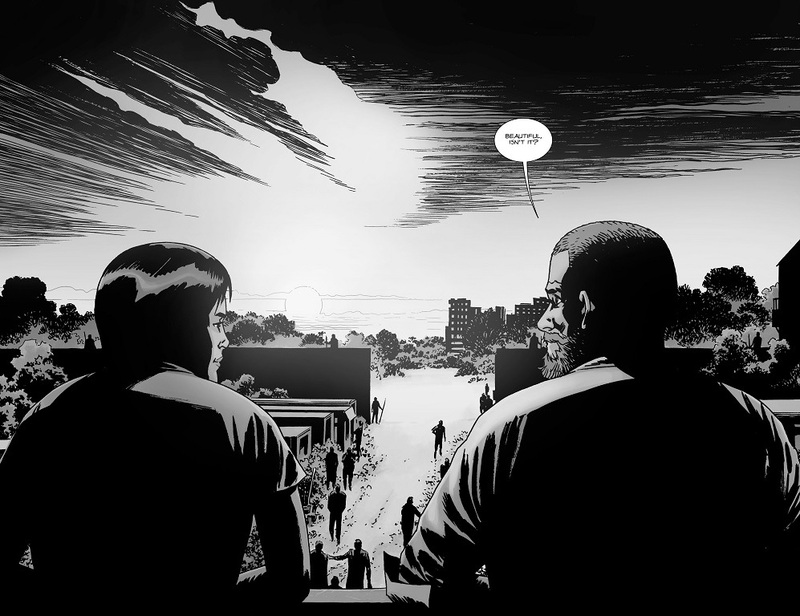 This entry was posted in The Walking Dead and tagged Andrea, Carl Grimes, Charlie Adlard, Cliff Rathburn, Dante, Dr. Eugene Porter, Dwight, Heath, Jesus, Maggie Greene, Magna, Michonne, Negan, Rick Grimes, roamers, Robert Kirkman, Rosita, Stefano Gaudiano, survivors, The Hilltop, The Sanctuary, The Saviors, The Walking Dead, zombies by omarid513. Bookmark the permalink.